The terms glucosamine and glutamine may sound and look similar, but they are very different organic compounds that perform different roles in your body. Both are often sold as dietary supplements to help with exercise recovery. There are no recommended daily intake for glucosamine or glutamine, and you do not need to include these compounds in your diet. Glutamine is a type of amino acid your body makes from glutamic acid. Amino acids are the basic building blocks of proteins. Glucoasmine, however, is a type of amino sugar, which means it contains properties of both proteins and glucose. 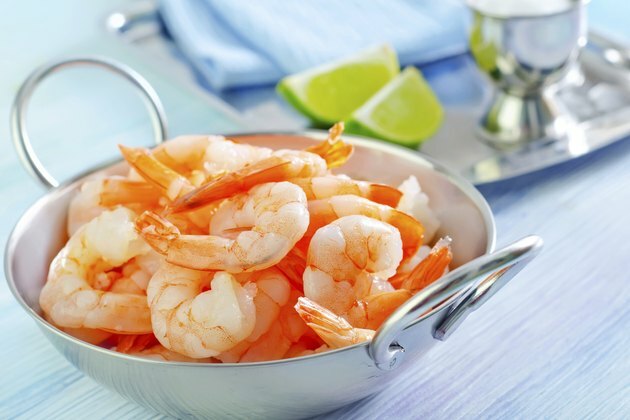 It is part of the structures of chitin, which is the outer shell of shrimp and shellfish, animal bones and connective tissues. Glutamine provides fuel for your gastrointestinal tract, particularly in the cells in the linings of your small intestines. According to biologist George Mateljan, author of "World's Healthiest Foods," glutamine also provides the main structures for these cells to help them resist against disease-causing microorganisms and minimize the absorption of allergenic molecules. Your white blood cells and muscles uses glutamine, along with glucose, as an immediate fuel source. Glucosamine plays a role in building cartilage, which is a series of connective tissues located between joints. This cushions the bones as they move along each other. The University of Maryland Medical Center states that glucosamine can help prevent or reduce the progression rate of osteoarthritis. Glucosamine supplementation -- when combined with another compound call chondroitin -- helps patients with mild osteoarthritis to reduce pain. However, it does not help those with severe osteoarthritis. Although you cannot get glucosamine from your diet, you can get glutamine from meats, cabbage and beets, according to Mateljan. Gluatmine is also available in protein shakes and protein powder mixes. Get advice from a physician before taking glucosamine. According to the University of Maryland Medical Center, glucosamine can negatively interact with some medications and other body functions. Minor side effects of glucosamine supplementation include upset stomach, heartburn, indigestion, abdominal cramping and diarrhea. Glucosamine can cause insulin to work less effectively in absorbing sugar and cause stomach ulcers when you take anti-inflammatory drugs with glucosamine. Toxicity and deficiency of glutamine is very uncommon since is it an amino acid. However, Mateljan suggests people with epilepsy or bipolar disorder and those who are allergic to monosodium glutamate, or MSG, should not take glutamine supplementation. Many supplement companies claim that glucosamine supplementation can alleviate joint pain and restore cartilage in your joints and glutamine can help your body synthesize protein and glucose faster after exercise. According to Gordon Wardlaw, a former nutrition professor at Ohio State University, these claims are not conclusive. Consult with a qualified health care professional before taking these supplements.